Check Engine Light? Car trouble? We take the guesswork out of diagnostics. At Sil’s Auto Centre in Mississauga, our professional auto mechanics are not only experienced and trained on various car repair and auto repair services, but they are experts at auto diagnostic services. 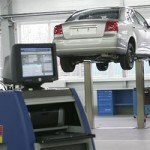 Our facility is equipped with the most up-to-date, modern, advanced computer diagnostic technology and equipment. Is your car making weird noises, like knocks, rattles and pings? No matter what symptom or problem you may be experiencing with your car, the licensed auto mechanics at Sil’s Auto Centre can help precisely pinpoint the cause and give you their expert diagnosis and recommendations on car repairs and services. We know you rely on your car for your transportation needs. We can help you get back on the road with peace-of-mind. When does the symptom happen? When you first start the car? When you’ve been running the car for awhile? Call to schedule your diagnostic service appointment at Sil’s Auto Centre.